Considered one of the greatest opera singers of all time, Carlo Broschi (1705 - 1782), better known by his stage name Farinelli, was castrated during adolescence in order to preserve his angelic voice. This procedure lasted for some three centuries in Italy, and the resultant lack of testosterone left male singers with an unparalleled vocal range. These deformed, rigorously trained and permanently childlike figures often became enormously successful, with many, including the great Farinelli, giving performances to huge crowds all across Europe. Gerard Corbiau’s 1994 biopic of the singer was enthusiastically received, and in addition to winning a Golden Globe was also nominated for the Academy Award for Best Foreign Language Film. 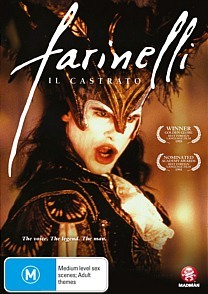 Much dramatic license was taken, for instance in depicting Farinelli’s tortured relationship with his brother and his supposed run-ins with the distinctly villainous composer Handel, but the film largely constitutes an intense and convincingly-evoked period melodrama in the style of Amadeus. And as in Amadeus the performances are strong and the sets and costumes flamboyantly resplendent, but it’s the music that really makes the film: Farinelli’s incomparable voice, reportedly recreated by digitally combining that of a female soprano and a male countertenor, soars above the mundane of the everyday and transports viewers, as it did the spectators of a previous time, to a higher plateau.